What do your favorite movies say about your creative perspective? What might they say about your innovative character? What might you learn about your own purpose and values by identifying with the characters from your favorite movies? These are questions first posed by Mike Brown, in his Brainzooming blog. Both Mike’s article and the follow-up article by one of his readers, Leslie Heizman, inspired me to consider my favorite movies and their characters, as well as the subject of how powerfully movies teach, and what we might learn from them. I will list five of my favorite movies below, then discuss each of them in the coming days. I plan to particularly discuss why and how the story and characters affect me, and how each helps define my character and values. These are not listed in priority order, but in the order in which I plan to write about them. Groundhog Day – A weatherman finds himself living the worst day of his life over and over again. What if your actions had no long term effect? Would you change them? How might they change you? Wouldn’t it be nice to have the opportunity, but not an eternity, to “get it right”? Elizabeth – A film of the early years of the reign of Elizabeth I of England and her difficult task of learning what is necessary to be a monarch. She has many advisors, but which ones should she trust? Will she make the right decisions? The Razor’s Edge – The story of one man’s search for himself. This modern movie version is derived from the W. Somerset Maugham classic novel, whose epigraph inspired The Intersection of Purpose and Now. The main character had everything and wanted nothing. He learned that he had nothing and wanted everything. He saved the world and then it shattered. The path to enlightenment is as sharp and narrow as a razor’s edge. Apollo 13 – Houston, we have a problem. True story of the moon-bound mission that developed severe trouble and the men that rescued it with skill and dedication. Rich with characters, I could write volumes about this movie. 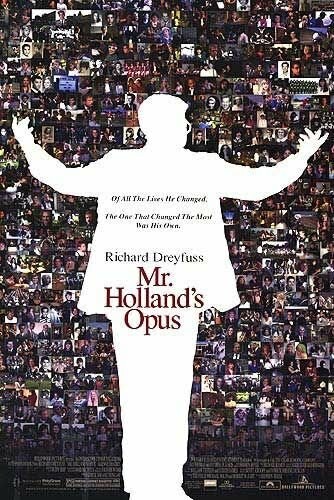 Mr. Holland’s Opus – A frustrated composer finds fulfillment as a high school music teacher. “We are your symphony Mr. Holland. We are the melodies and the notes of your opus. We are the music of your life.” Perhaps my favorite character and plot; again, I could write volumes. I have used movie clips in my training and development programs and keynote presentations over the years. I will also include links to my favorite books on the subject through Amazon.com, starting with the all-time best, “Movies to Manage By“. Please keep in mind, if you use movies or movie clips, to do so properly, legally and ethically. To do so properly, contact me directly for assistance. As for legally and ethically, purchase a license from the Motion Picture Licensing Company. So let’s enjoy some movies together. Come back and join me over the next several days, here at The Intersection of Purpose and Now.